A girl is making a purchase at the place where I work. Her wallet is lying on the front desk. “What is that, duct tape?” I ask her. “Yeah, it’s all duct tape,” she says, turning it in her hands so Ashley and I can get a look at it. “Can I post your wallet to the Internet?” I ask her. 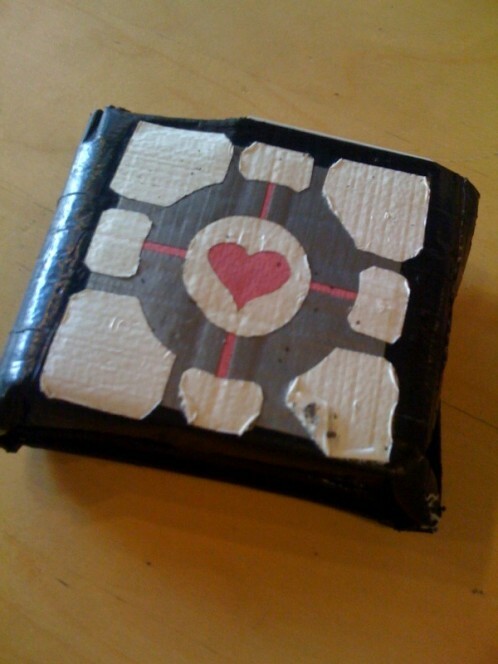 “I don’t mind,” she says, reluctantly adding that there are plenty other Companion Cube wallets out there, and also, plenty other duct tape wallets out there. This, however, is the only Companion Cube -themed craft I’ve seen in the wild, so I am delighted. “Can I write down your name?” I ask her. I scrawl it on a Post-It. “Do you want to have a last name?” I ask her. Crystal Chiang commissioned this incredible, 100% duct tape wallet, using the alchemy forum at Etsy.com. She estimates the wallet set her back all of about 20 bucks. It’s a little worse-for-wear, of course, because it is an actual, in-use wallet, but I find that the scuffs and the peeling corner only add to its rough-hewn charm. “And I’m never alone!” Crystal concludes. Later, I will explain to my coworker Ashley what a Companion Cube is.